Sub-series consists of published promotional pamphlets, brochures, and other materials produced by Eastman Kodak, its subsidiaries, and external companies between 1919 and 2004. Includes promotional materials targeted toward dealers and retailers of Kodak products, amateur and professional photographers, and Kodak's business market. 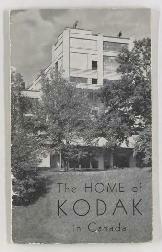 Also contains published materials promoting Kodak as a company, including company histories, biographies of George Eastman, and company profiles. Sub-series is arranged into sub-sub-series based on the target market, subject, and creator of the promotional material. For clipped advertisements and other Kodak press, see: 2005.001.08.05. For additional promotional brochures for Kodak Park, Kodak cameras, and Kodak photographic film, see: 2005.001.08.05.17.